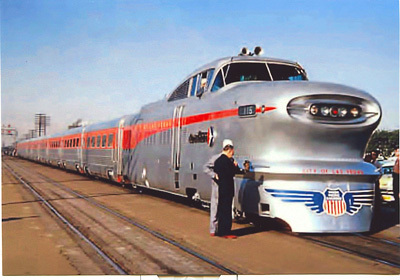 The GM Designer responsible for the AeroTrain project Charles "Chuck" Jordan is retired and living in Southern California. "Chuck" was very helpful in confirming design specifications and details of the AeroTrain. "Chuck" was the primary designer of the 1958 Corvette, and was named Cadillac?s Chief of Design in 1959. We owe a huge "THANK YOU" to Chuck for his help on this project. We expect April 2007 delivery of the HO models, the N models a bit later on. ** Estimated Retail price includes about a 10% inflation factor for items to be delivered during 2007 due to rising oil, transportation, wages and material costs in China that our China factory has already advised us of. As with all very complicated projects, this delivery date is only an educated projection. Some delay may occur on any project of this size and complexity. Details on the "N" Scale version of the AeroTrain. Con-Cor will offer the AeroTrain in a basic set of 4 units, the Locomotive 2 coaches and the Observation car. And "add-on" sets of 3 more coaches will be offered. So a modeler can buy the basic 4 unit set, plus one "add-on" coach set to make a 7 car "AeroTrain", or buy 2 of the "add-on" coach sets to reproduce the full 10 car prototype train. "N" Version Add-On 3 car Coach set, Price "to be determined"